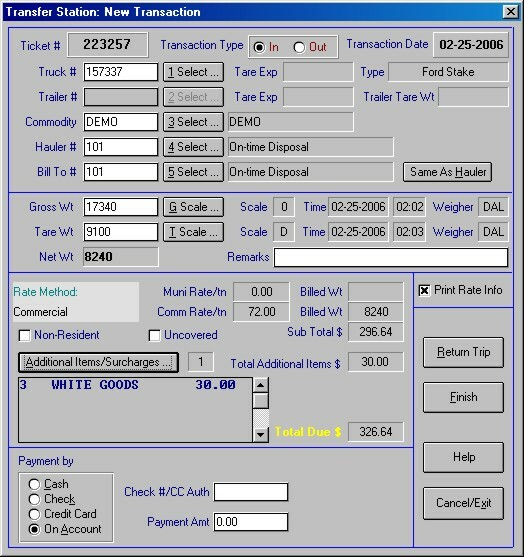 TWOS/ TWOS Elite is a powerful and configurable software system for managing landfills, transfer stations, sand and gravel yards, scrap yards, and any other business which need to keep track of materials passing over a truck scale. It has many advantages over competing products including lower cost (in all areas of product, customization, and support), very configurable, very intuitive, and many "automatic" timesaving features. Taxes and structured delivery fees are optional on each transaction ticket for outgoing commodity sales. Supports up to 3 different tax rates for different states. Built-in scale device driver supports virtually any type or brand of truck scale indicator. TWOS purchase includes free custom driver support for your scale if not already provided in scale list. Up to 4 independent "companies" may be defined for the system � each sharing the same scale but separate transaction, accounts, commodities, and trucks/trailers databases. Switching to another company can be done at the time of ticketing. Sticker sales area for those municipalities wishing to admit residents only into transfer station. Imports residents from external tax or motor vehicle database. Accounting/billing module supports automatic invoice generation for all transactions in a given period � a few mouse clicks will generate and print ready-to-mail invoices! Billing system can be located off-site. Databases can be synchronized by daily "upload" disk, automatic modem dial-in to billing site, or shared on a connected network. 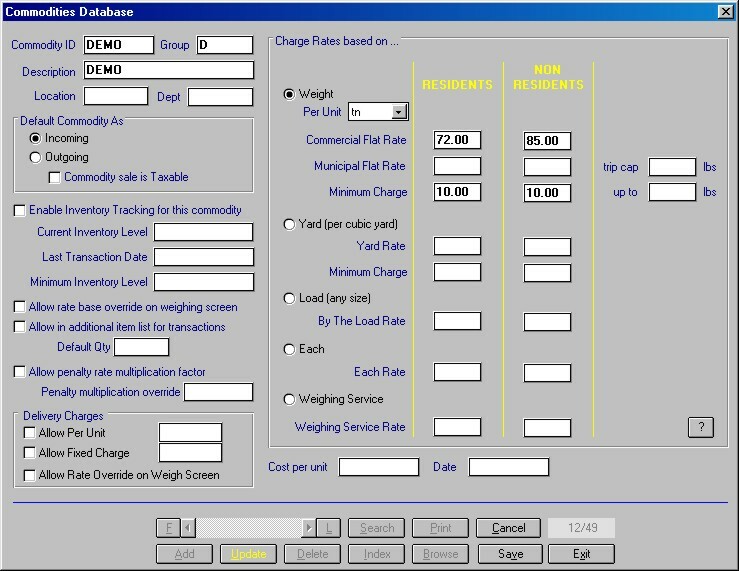 Scale activity log records all vehicles going over the scale regardless if a transaction was processed. Use with video capture module to record image of each activity. Base TWOS system with support for one scale and an off-site transaction data collection system (for billing and reporting). Includes installation (within 125 miles of Rhode Island), half day training, custom scale driver programming, some custom ticket design, and one year updates - starts at $2500. Invoicing and Statements module with many types of accounting reports - add $1500. 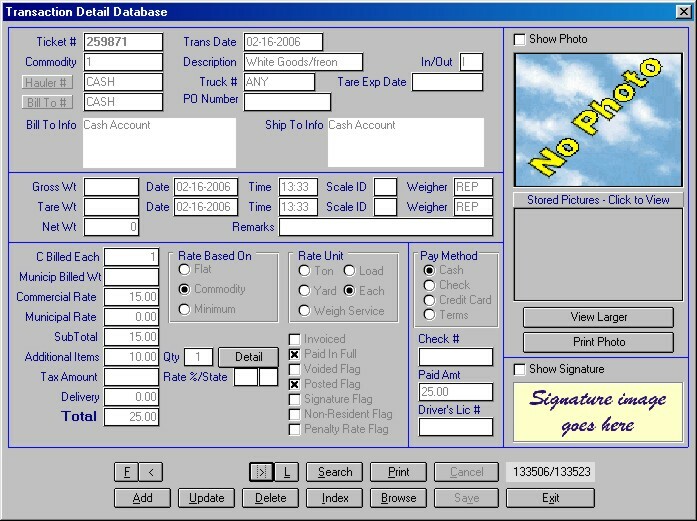 If you would like something added that the software currently does not support, we can accomodate your needs with customization. At least Pentium III based PC running Microsoft Windows 98SE/ME/XP, 1024x768 graphics card, mouse/touchscreen, serial port for scale, dot-matrix printer for tickets, laser printer for reports. USB port for backing up to memory stick. We require either PC Anywhere/dedicated phone line or Internet/gotomypc.com for connection into your computer(s) for remote support. If you are from RI/CT/MA and are looking for a truck scale or a complete turn-key installation of a scalehouse building, etc, please contact Matt Geisser at Central Scale, Warwick RI -- (401-467-7500) -- they've been in business for over 60 years. A comprehensive brochure package with screen shots and sample reports are available upon request. We are also available to visit your facility and provide a demo of the software. References from our existing municipal and commercial customers are available upon request. 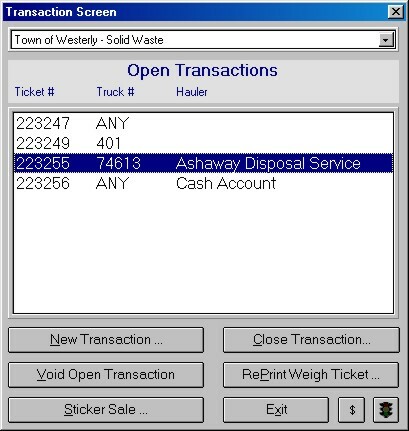 Open transaction screen - where the weigher is able to start a new transaction, close out an existing transaction, void a ticket, or reprint a ticket. Everything about a transaction is stored in its own database. Privilaged users can have access to this database. There is much flexibity in setting up rates for different commodities. 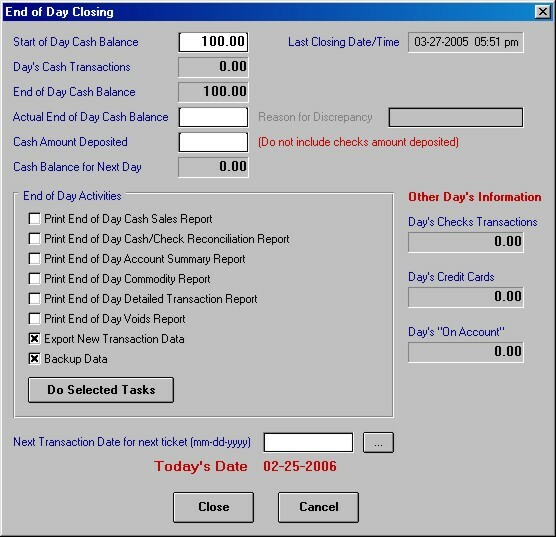 End of day closing makes it easy for the weigher to close out the day's transactions and perform a number of tasks.